MightyX Pro Mass Gainer helps to fuel stormy lift; reinforced with Glutamine, Creatine, Minerals and Vitamins. MightyX Pro enables to fire quick muscle gain in bodybuilders. The Perfect blend of Glutamine & its precursors, which supports lean mass gains, recovery & immune system function. 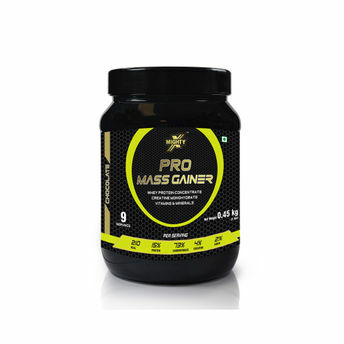 This instantized mass gainer makes a gigantic post- workout and between meals shake. Additional Information: MightyX for health enthusiasts is an indigenous health and nutrition food brand founded with a vision of "Nutrition For All" and offering products ranging from nutrition (for extreme users) to general health (for convenience users). With authenticity guarantee and quality at its core, MightyX is destined to be India's numero-uno brand in health and nutrition segment! Explore the entire range of Lean available on Nykaa. Shop more MightyX products here.You can browse through the complete world of MightyX Lean .Alternatively, you can also find many more products from the MightyX Pro Mass Gainer Chocolate Powder range.